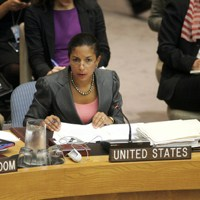 Diplomatic Fallout: Did Susan Rice Save the U.N. From Irrelevance? How will Susan Rice be remembered at the United Nations? Since President Barack Obama announced his decision to appoint Rice as his national security adviser last week, analyses of her service at the U.N. since 2009 have swung from the gossipy to the philosophical. The gossips have recycled stories of Rice’s robust sparring with her counterparts, which at times involved fiery language. The philosophers have reflected on the ambassador’s role in advancing the cause of humanitarian intervention in Libya, as well as in later debates over nonintervention in Syria.